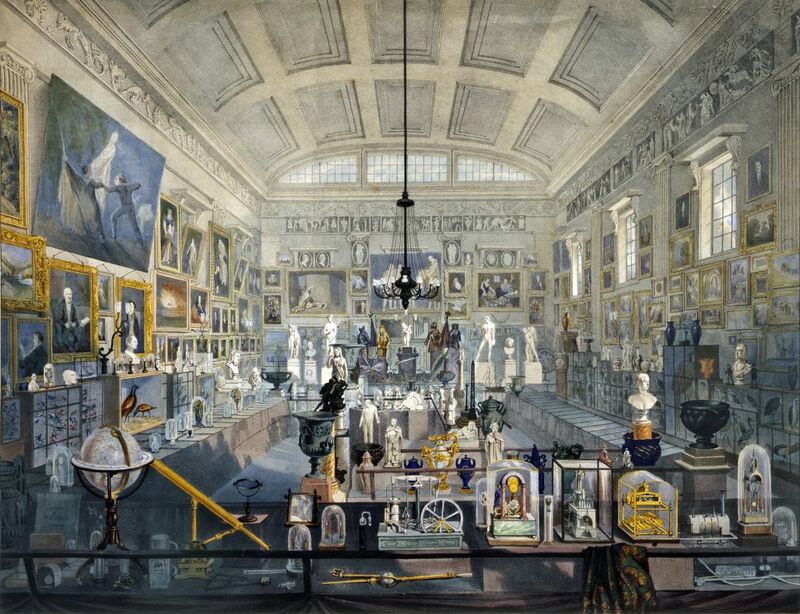 Over the last five years Buxton Museum has bought over 30 artworks as part of the Enlightenment! project. These range from oil paintings by Royal Academy artists to watercolours by unknown amateurs. 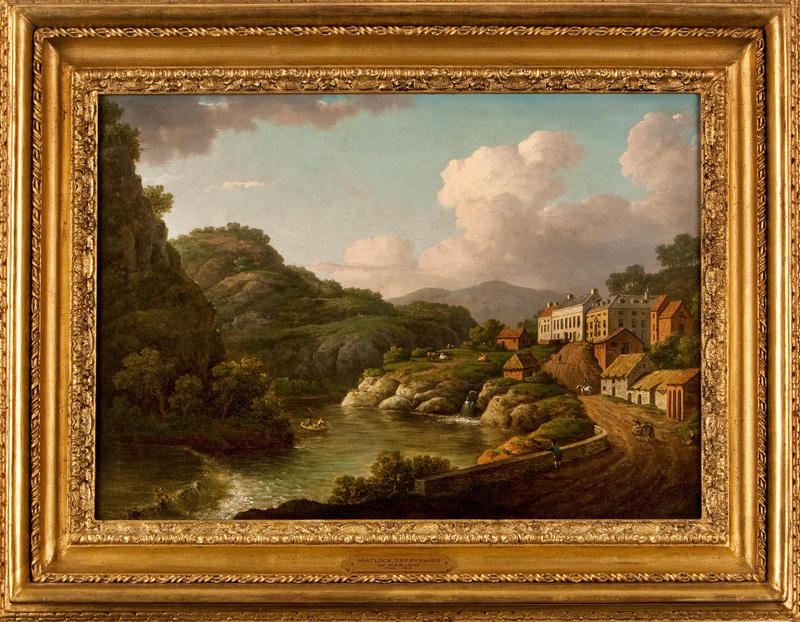 What the pictures all have in common, is that they show either Derbyshire views or Derbyshire people and were created between 1743 and about 1880. All these artworks have been on display in the Museum, and many of them have toured to Derby Museum and Art Gallery and Strutt’s North Mill. We don’t have a permanent art gallery at the Museum. Instead we incorporate art into the Wonders of the Peak Gallery, especially in the Georgian Room, and into our temporary exhibition programme. As part of Collections in the Landscape we are looking at redeveloping the Wonders of the Peak Gallery and have a commitment to put 10% more objects on display. Salon hangs were popular in the 18th and 19th centuries. This is an image of the 1839 Derby Exhibition at the Mechanics Institute in Derby. I am very keen to get more art on display and one way of doing this in a small space is by implementing a salon hang – basically floor to ceiling art. Although I like salon hangs, I do find that they don’t always work and that pictures can sometimes blend too much into the background. Traditionally the ‘best’ paintings were hung ‘on the line’ i.e at eye level. While those further down the hierarchy were ‘skied’, meaning that you can’t get a decent look at them! The benefits of the salon hang, is that you are able to get more art on show and they are displayed in an appropriate period style. I think Buxton Museum’s Derbyshire views would work well in this scenario. It would give the wall a strong theme and comparisons could be made easily between the different artists’ interpretations of the views. Oils could be up there semi-permanently while works on paper could be on a rolling programme, limiting their exposure to the light. We could also look at drawers, possibly in a Georgian Gentleman’s style cabinet in which to display prints and watercolours, which would allow public access while limiting light damage. 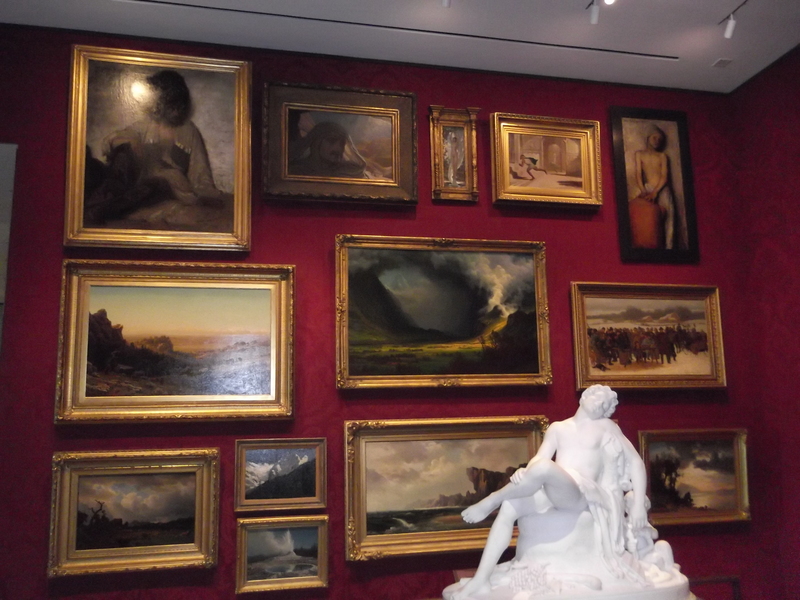 It can be tricky to get the interpretation right on a salon hang, as it doesn’t lend itself to the traditional museum label. While visiting museums over the last 6 months I have been keeping my eyes peeled for ideas. I enjoyed the hang at the Clarke Institute in Massachusetts, USA. Here they’ve hung over 80 paintings in a small room and the bulk of the interpretation is accessed via tablets, which are loaned to visitors. It creates an interesting exhibition and I enjoyed the ‘hodgepodgeness’ of depictions of American Indians displayed alongside a Renaissance Madonna and British coastal scenes. 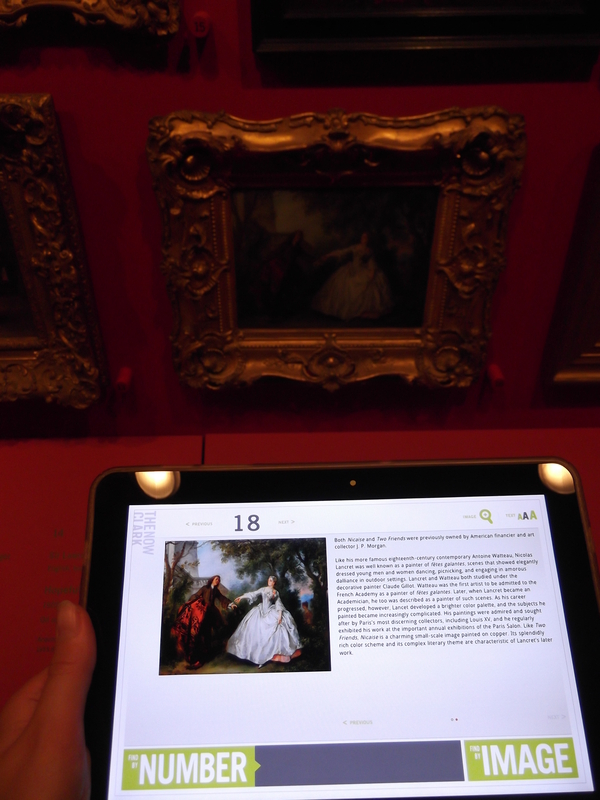 The tablet displayed a programme called uExplore which gave further information on the paintings and sometimes also relevant audio and video content. 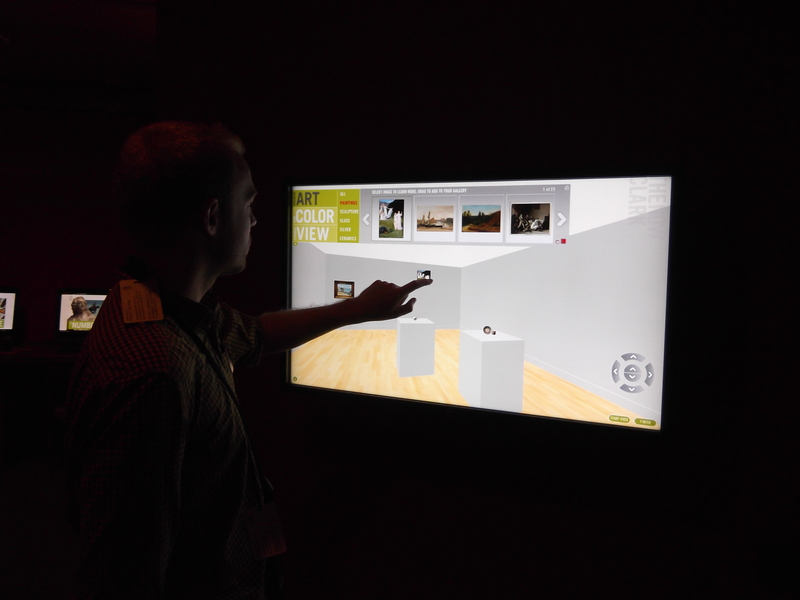 There was another interactive app called uCurate which allows visitors to digitally curate their own exhibition – you choose the paintings, wall colours, design layout etc. Both apps are available to use from the comfort of your own home – http://www.clarkart.edu/exhibitions/remix/content/exhibition.cfm We’d be interested to know what you think?